Creekside Has Free Wireless Internet Access! 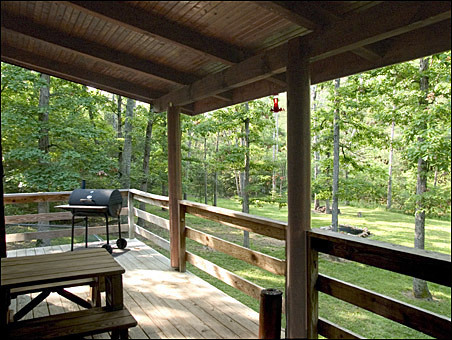 If enjoying your honeymoon, fishing trip, or relaxing get-away weekend in total peace, quiet, and privacy, Creekside is for you. There are no other buildings around for 1/2 of a mile - it is quiet. 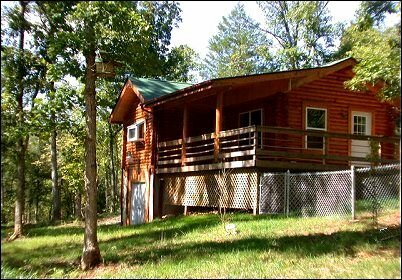 A true, modern, fully furnished log cabin hidden in a clearing in the middle of 80 acres of forest assures your privacy. 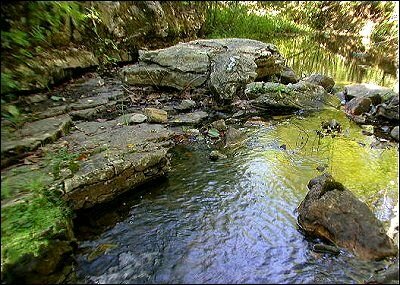 A soothing creek flowing year around over limestone formations creates peace. The land type is a true forested Ozark bottomland valley. The Oak-Hickory-Pine forest, with its rich top soil, supports a wide range of Ozark flora and fauna. The air carries a refreshing scent of deep forest. 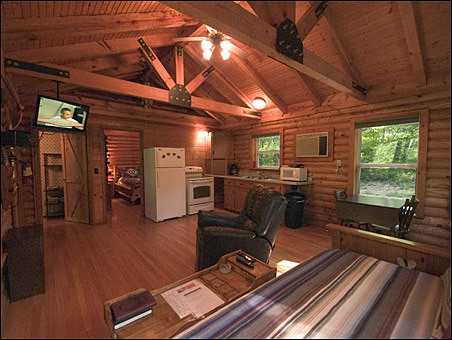 And when inside our log cabin, you'll be comfortable any time of year! Regardless of what you want to do on your vacation, we're not far from it! You'll be 10 minutes north of two trout docks at the confluence of the White and North Fork rivers. At the confluence you can also do some wade fishing in a world class trout fishery. The trout docks can provide you with a professional fishing guide and John boat rentals. So you'll be close to some of the best trout fishing in the world. Creekside Drive is 1/2 of a mile long, and runs off Baxter County Road 63 right near the Otter Creek Bridge. We're ten minutes south of the Lake Norfork Dam, which means you can enjoy your favorite lake water sport. The village of Norfork is 10 minutes to the south where you can buy gas, food, and fishing tackle. When you're ready for heavy duty shopping, the City of Mountain Home is 20 minutes away. A Wal-Mart Super Center (open 24/7) is 15 minutes away. If you are an amateur naturalist looking for a special new ecological land type to explore, you are in luck. Naturalists enjoy numerous pursuits everywhere from within a few feet of the cabin along, along the creek, and along our well maintained gravel road that is easy to walk. You can also explore hiking trails and old logging roads running through over 100,000 public acres of classic Ozark forests in the nearby Sylamore District of the Ozark National Forest. There are several cedar glades where you'll find native wildflowers, birds, and wildlife. The hiking trail through Cliffty Canyon Special Interest Botanical Area offers some impressive Ozark vegetation, wild flower glades, streams, and barrens. Wildflower walks, bird watching, macro and landscape photography, cave tours, wild turkey, are all within an hour or less from the cabin. After a fun day in the field you can enjoy a hot bath in our large Jacuzzi tub. Behind, and in front of the cabin, are high ridges. Over the eons, rain has filled this little valley with rich top soil. Since this soil is rare in the Ozark uplands, and since this soil supports many flowers and plants that no other area soil will support, a wide range of animals and birds come here to feed. Wild turkey peck among the bank weeds for grass hoppers. Deer and small mammals come for the mineral licks along the creek. The creek is full of crayfish, minnows, and frogs, which children thrill to chase and catch. For a special treat come in April during the redbud and dogwood tree blooms. Rates are from $150 per night plus tax for multi-night stays. One night only stays are from $195 per night plus tax. All rates are based on the first 2 people. Extra persons are $15 each per night. A valid credit card is required at booking. We rent by the night or by the week most days of the year. Holiday weeks, holiday weekends, and one night stays are charged in full at the time of booking and are not refundable. Spring break weeks and weekends are considered holidays. Regular holiday weekends require a 3 night minimum stay. We require a full one night's deposit to confirm your reservation. A check can be used to pay your deposit, with a valid credit card on file, if the check is received within 7 days of your booking date. Reservations made within 30 days of arrival are charged in full at booking, and are not refundable. Cabin renter must be at least 21 years of age, however married people and/or honeymooners under 21 years of age are welcome. There will be a $50.00 charge for NSF checks. Any damages to the cabin or the cabin property are the responsibility of the renter and will be charged accordingly. Extra cleaning charges will apply if unusual out-of-the ordinary cleaning is required inside, or outside, upon check out. All renters are allowed the rebooking option if cancellation is needed. Holiday Weeks, Holiday Weekends, and One Night Stays, are charged in full at booking and will not be refunded. Cancellations or changes by email are not accepted and will result in a full charge of your reservation. Please call us instead. Cancellations must be made 30 days prior to your arrival date. Any granted refunds will be minus our handling fee of � of a one nights stay of all occupants reserved. Cancellations made within 30 days of arrival will result in the full charge of all nights and occupants reserved. No refunds will be made for early departures, inclement weather, unexpected medical issues, or any other reason, within 30 days of your arrival, or upon your arrival. If you cancel within 30 days of your arrival, or upon your arrival, you can rebook your stay with the same amount of nights without any loss, Subject to availability. We do not accept holiday weeks or Holiday weekends for rebooking. We are Pet Friendly. We do not restrict size or weight limits on your dog. An additional pet cleaning fee will apply. We do have a fenced area connected to the porch for your pets convenience. Notification that pets will accompany you is required at booking. Please ensure that your dog is up to date on all vaccinations and heartworm/flea/tick preventatives.We are not responsible for any injury, loss of your pet, or any illness contracted by your pet during or after your stay. We do not provide pet bedding, please bring your own. Any and all damages caused by your pet to our cabin, its contents, or our property, will be your financial responsibility. Please do not leave your pet loose/unattended in the cabin. No campfires are allowed during County or area burn bans, or during burn ban warning days. Please ask us for ban information before making fires! Please extinguish all fires upon leaving the property. No fires are to be left unattended at any time. Fire damage to our property, or surrounding properties, will be the responsibility of the cabin renter. This includes all fines incurred for damage to forest and personal properties from campfires, fireworks, grill fires, negligence inside or out, and fines incurred for burning during bans or burn warning days. We are a member of the Arkansas Forestry Association and the Acres for Wildlife program. Please help us keep our wildlife safe! Please Note: No firearms or 4-wheeler/ATV type vehicle use is allowed on the property. � Copyright 2002 to the present by Creekside Cabins. All rights reserved.